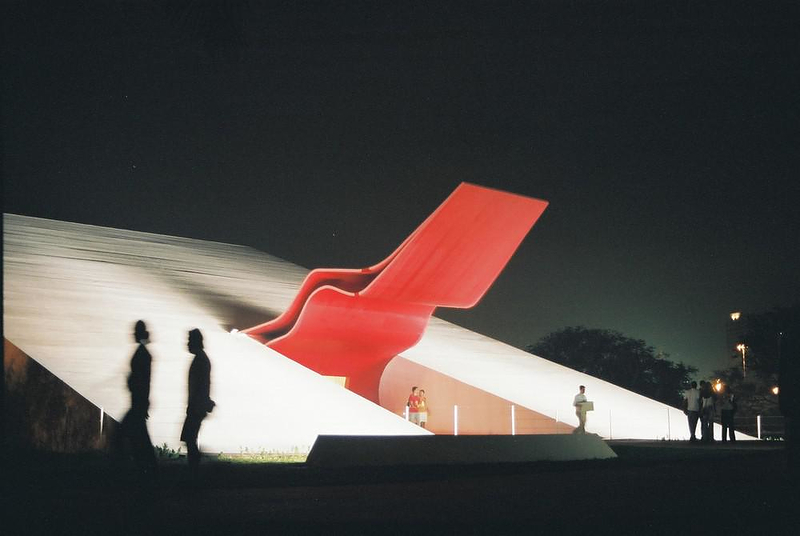 HomeBlogArchitectureIbirapuera Auditiorium by Oscar Niemeyer. 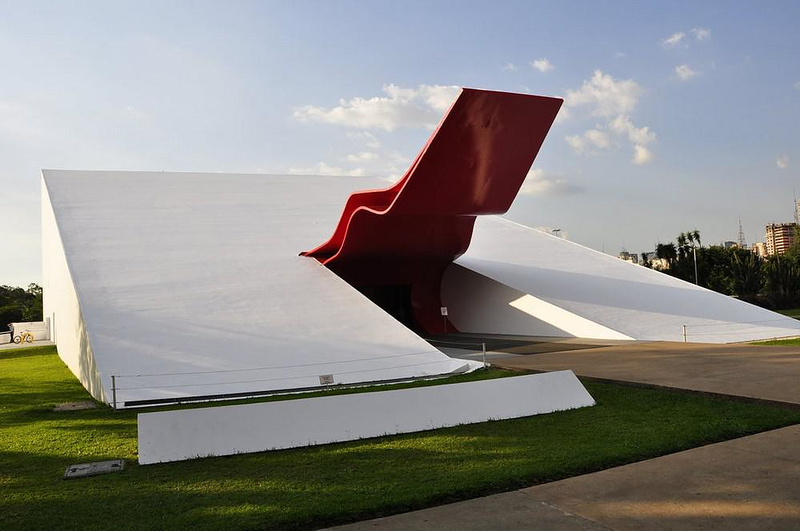 The Ibirapuera Auditiorium by Brazilian architect Oscar Niemeyer is a timelessly modern building that embodies all those distinctive features that characterize Niemeyer’s architectural style. The initial plans were conceived back in 1954, but the project was actually realized 50 years later. 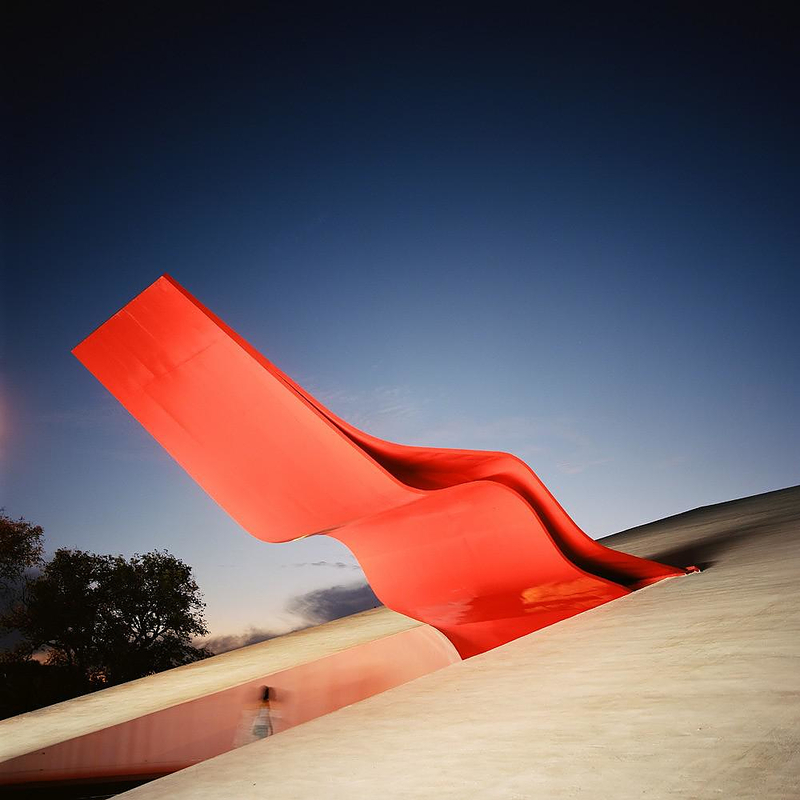 Niemeyer designed the entire park Ibirapuera, whose main attractions are the auditorium and second hemispherical building, the Oca. 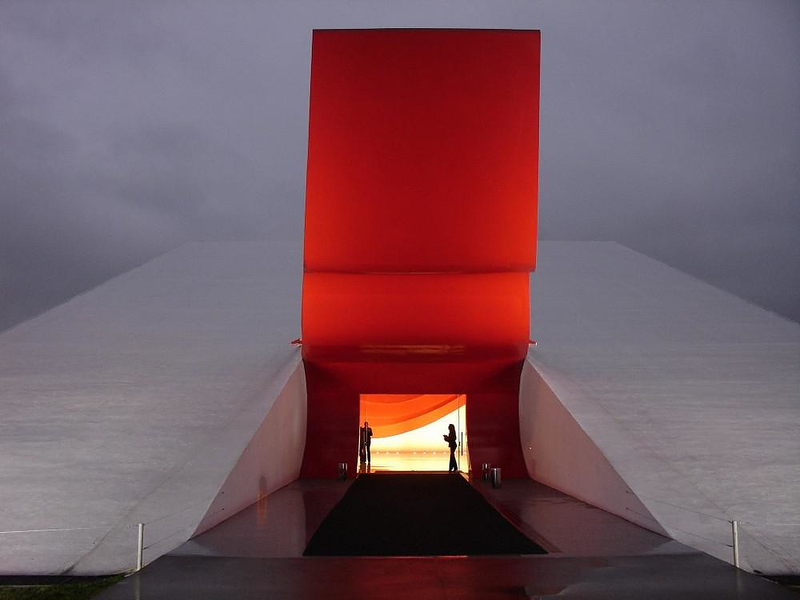 Volumetrically the building is a pure geometric block trapezoidal, made of reinforced concrete “as expected since reinforced concrete is Niemeyer’s favorite material”. 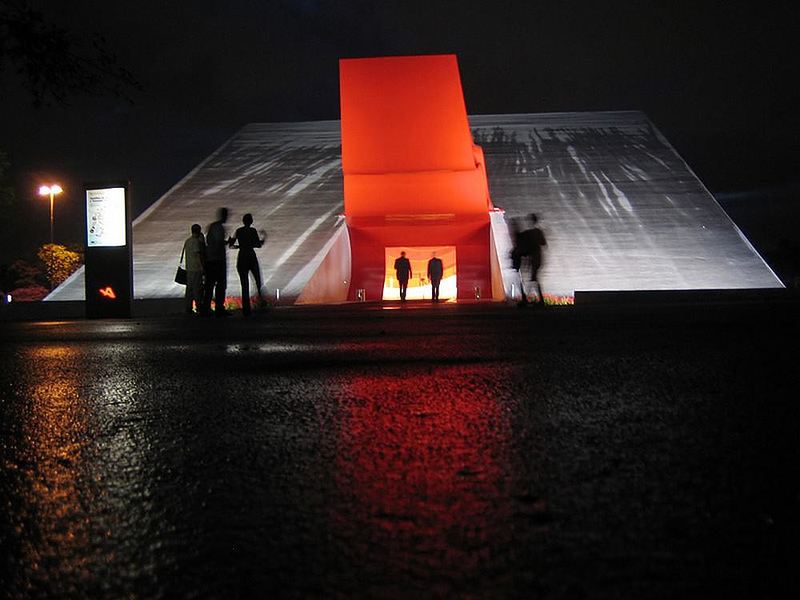 The most characteristic part of Ibirapuera Auditiorium is its impressive entrance, marked with a red metal marquee in the form of “tongues of fire”, which the architect himself called “Blaze”. 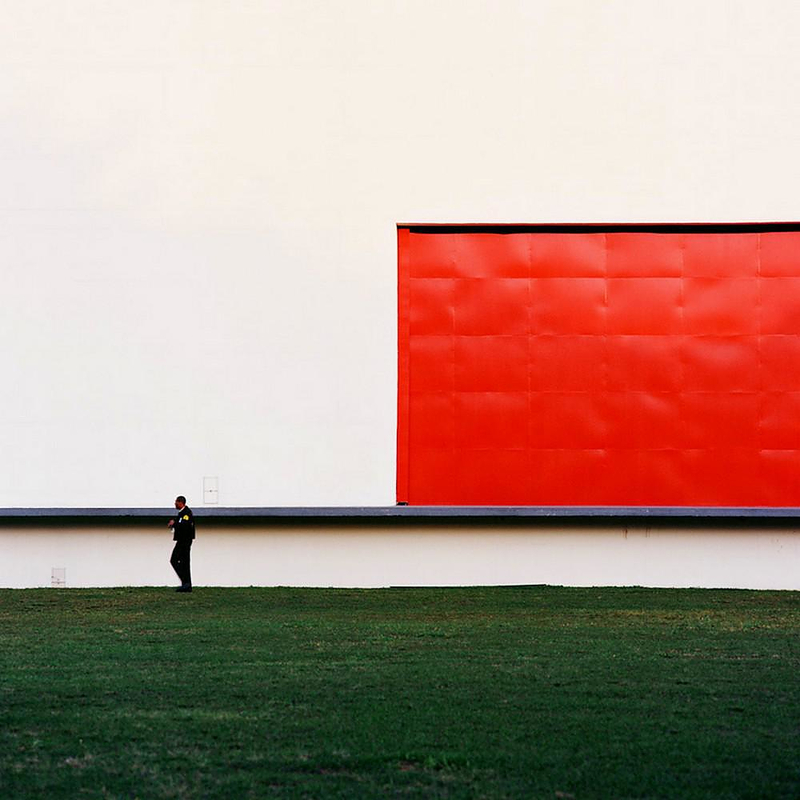 The rest of the building is painted in white color, which further accentuates the entrance, constituting an iconic symbol and trademark, not only of the building and its uses, but also of the entire park. The power of this symbol has its own official name: “Labareda”, meaning flame in Portuguese. 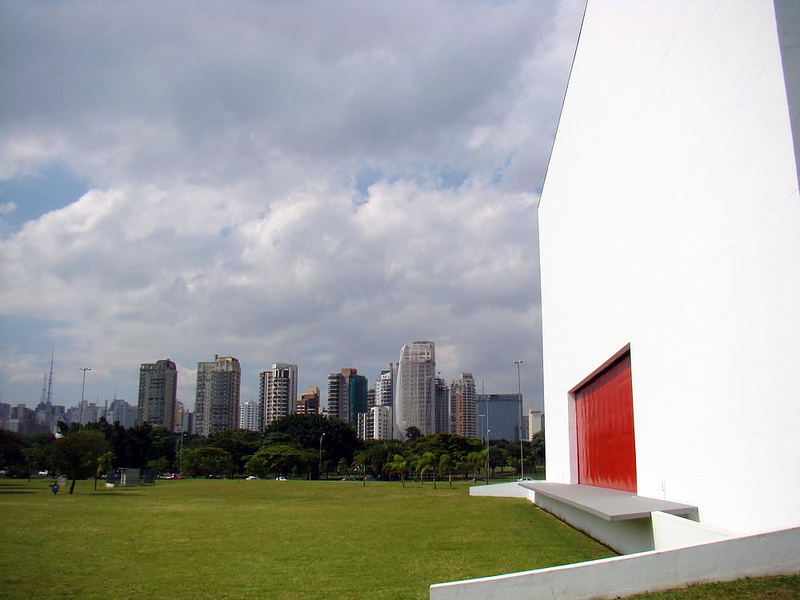 The architectural ensemble, with Ibirapuera and Oca, is a balanced set of pure geometric volumes. In the initial plan the setting was supplemented by an urban square, with housing and footbridge which unfortunately wasn’t built. 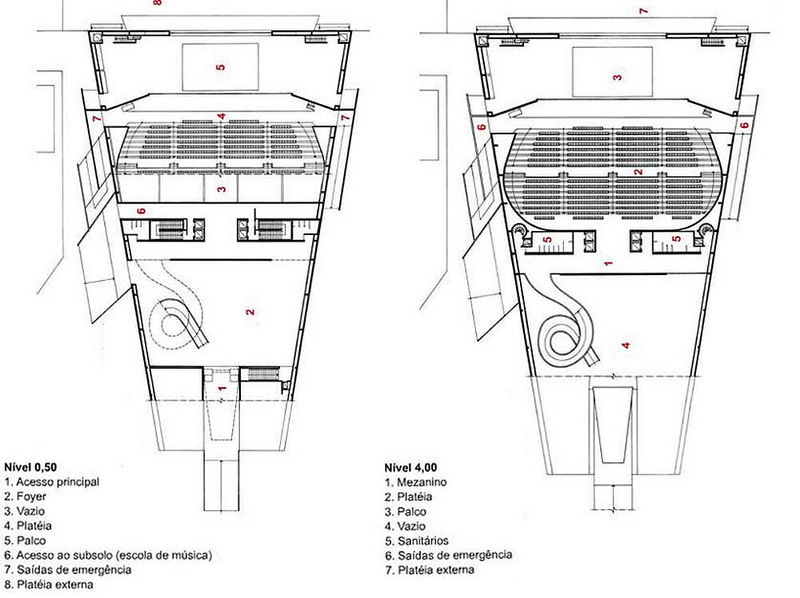 Internally the layout follows simple principles, with the main functional areas in sequence. On the ground floor one moves from the foyer, to the auditorium and then reaches the scene, while in the basement there are the administrative offices, the music school, dressing rooms and the bar. Another key element is a 20 m. long and 6 m. in height rear door which opens with a mechanical system of pulleys and counterweights that provides viewing access to viewers outside. This feature of building allows is particularly useful when the weather is nice, at it permits audience sitting outside the building to attend an event. 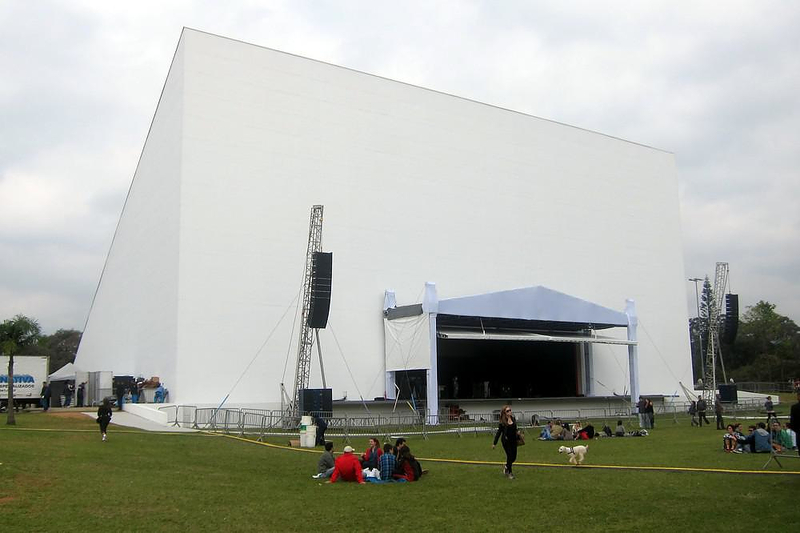 With this huge door open that total capacity of attendees to an even can reach 15,000 people. 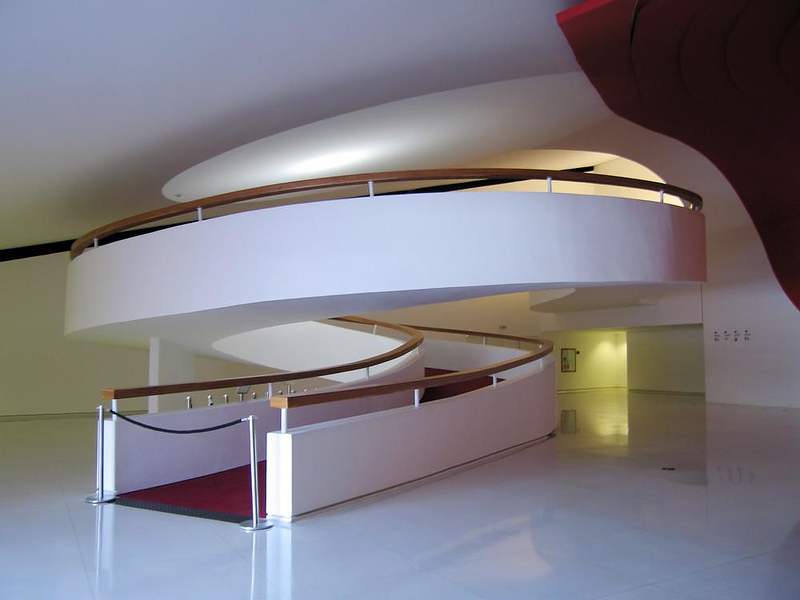 In the foyer meanders a long handrail wood with iron base accompanied by a spiral that leads to the amphitheater. 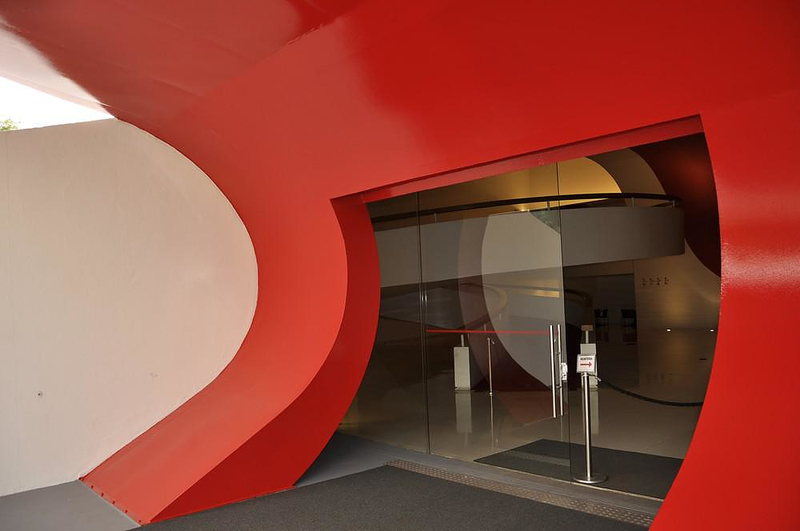 At the bottom floor, a huge red “wave” imposes itself, a modern sculpture signed by Tomie Ohtake. 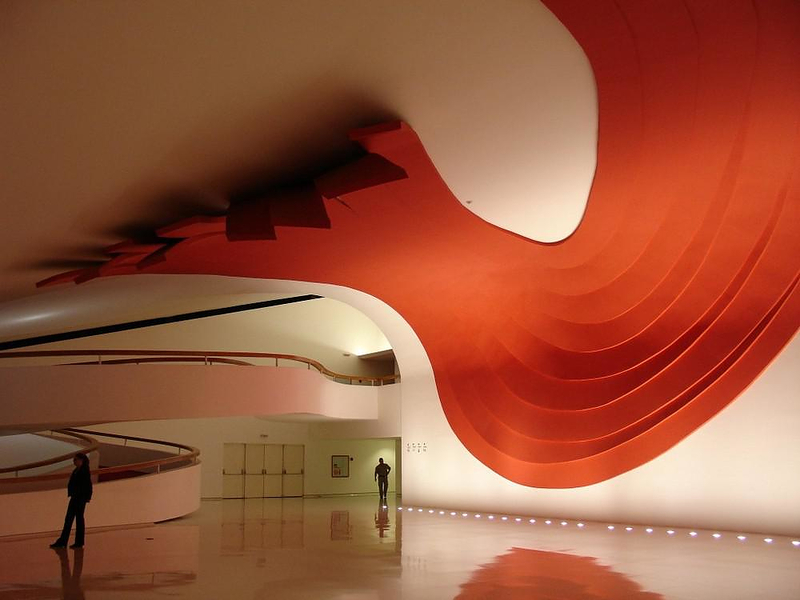 In the auditorium, the great arch of the front part of the stage deserves a special mention, with dimensions of 28 m. height, 15 m. depth, and 50 m. length. 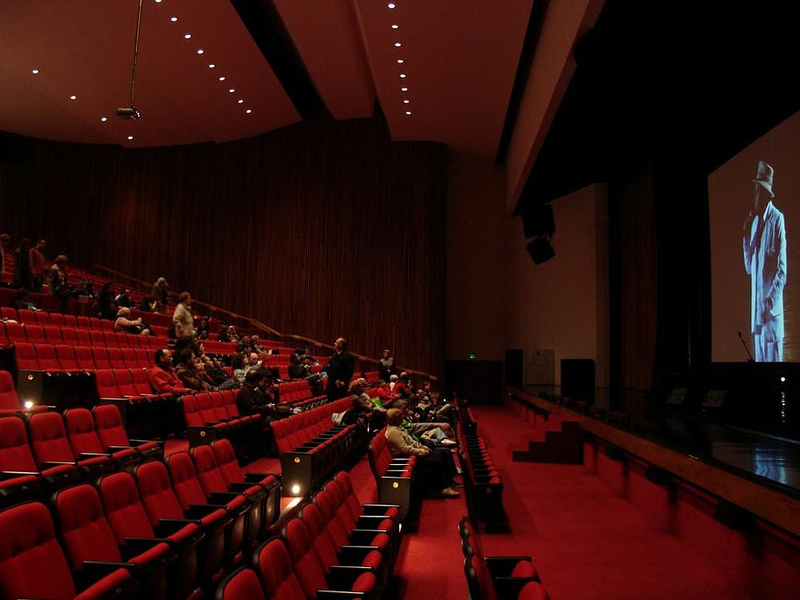 The capacity of the auditorium is 800 seats, with a provision for 14 wheelchair users, as well as 46 specially designed seats for the obese. The excellent acoustics are due to the wooden reliefs covering the walls. 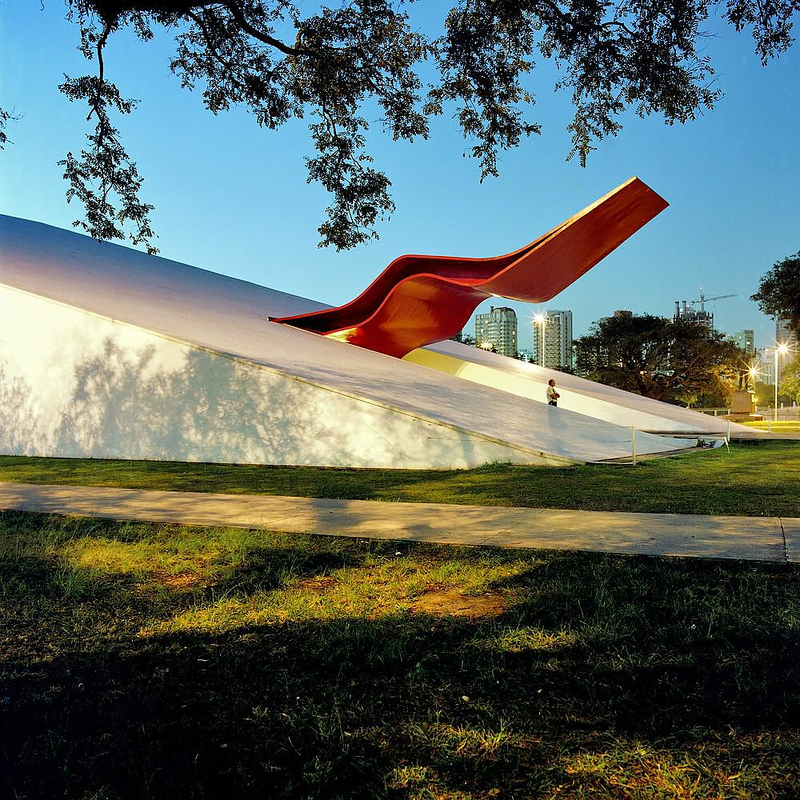 According to the management principals of the Ibirapuera Park the performances are free and take place on Sunday mornings, in harmony with nature and respecting the needs of the local ecosystem.